In 1981, while studying philosophy at Boston University, John took an elective course in woodworking at the Program In Artisanry (PIA), a school within the university. The revelation was immediate, like flipping a switch; building furniture was what he wanted to do. He became enamored with all aspects of the vocation; machinery, tools, hand work, joinery, drawing, creativity, and problem solving. He looked into transferring from the College of Liberal Arts to PIA, but it would have meant starting another four year program. A graduate student at PIA advised him to buy tools instead; “First, you’ll need a band saw.” In 1983 John received a BA in philosophy from the university. However, the interest in furniture making did not wane. In 1985 John and a friend, a former PIA student, decided to set up a small shop in South Natick, MA. Both were working for a nursery doing landscape construction, and the owner of the nursery agreed to rent them space. John purchased two used machines for the shop, a 20” band saw, and a 17” drill press. It was during this time that he learned the fundamentals of woodworking and how to design and build a piece of furniture. In 1988 John moved the shop to its current location, an antique barn in Hopkinton, MA. 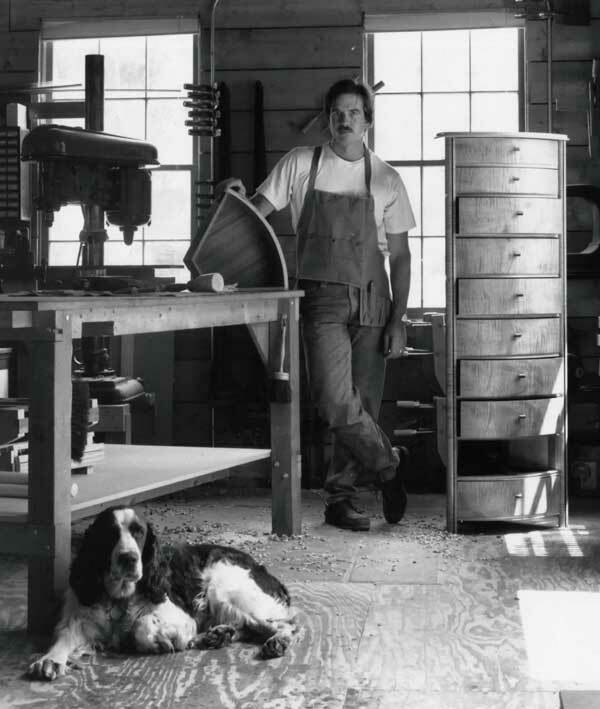 He has been designing and building furniture in the barn ever since. John is married with two children. He enjoys being outdoors, camping in the summer, and skiing in the winter. My husband and I were looking to have a china cabinet made and found Foster Woodworking right here in our own town. We were impressed with John from the start. A few days after talking about what we wanted we received a beautiful blueprint drawing of exactly what we wanted. The process was amazing and since John is in town we had the luxury of stopping by to see the progress first hand. The finished piece is exquisite and we couldn't be happier, it is our favorite piece of furniture. It is a piece that will last for generations to come. I look forward to working with John again in the future.